The first album began life in 2001 and finally saw the light of day in mid-2009. I am not only relieved, but actually very excited about this release, because the record is really good. All songs written by Chris Combs, and yes, they are copyrighted. Recorded in various incarnations of Planga-La Labs and Superpickle Sound. Produced by Adam Rabin and Chris Combs. "Like all great things, it began as a joke." In the late 20th century it seemed as if everybody was suing somebody for using their music without permission. Former acquaintances were coming out of the woodwork to claim authorship of a hit song. Large corporations developed the business model of using unlicensed music and paying out a settlement later in order to get around the problem of punk bands refusing to sell out. One unfortunate unwittingly sued himself, and it wasn't Stig O'Hara. What they all had in common was greed. It wasn't about intellectual/artistic property, but about money. Most authorship suits came well after the songs were hits. It wasn't an "oh, I just found out about this" situation, but rather a "the statute of limitations is about to run out, so I'd better file now" situation. Start a band called Public Domain. Find a popular artist who has recorded a song credited to Public Domain. Repeat steps 1-3 as often as needed. You may also wish to develop side projects by the names of Anonymous or Traditional. I loved the idea, but didn't really want to add to the already ridiculous number of ridiculous lawsuits. So the next iteration of the joke would be to write new songs for the sole purpose of getting the text "Copyright Public Domain" in the credits. That's a beautiful thing. But what songs would I write? Even by this time (2001) I was locked in the self-made cage of concept albums. I had written over a hundred songs by that time, but they were all associated with a particular project and couldn't be reused elsewhere. New, specific to Public Domain songs were needed. So what makes a song specific to Public Domain? "A song by any other name." Locate a public domain song title. You may not hear the original song, or see its music or lyrics. Write a new, original song using that title. 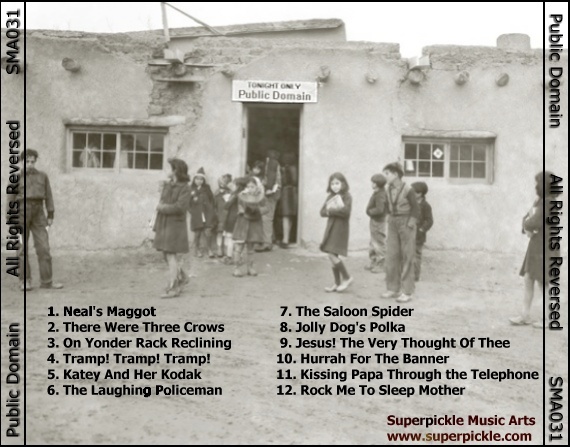 On 19 January, 2002, I wrote my first Public Domain song, "The Saloon Spider," a title from 1899. "Rock Me To Sleep Mother" got updated from its 1885 beginnings a few days later. "Neal's Maggot," from 1742, came two weeks later and instantly became the signature tune of the entire project. The number of Public Domain songs doubled within a few months. "The album that didn't happen." Adam Rabin was a supporter from the beginning, immediately offering to act as producer and release the album on his label, Superpickle Music Arts. He even issued a catalogue number, and I whipped up album art. But like all projects that interest me, this one got put aside to allow me time to work on the next new project (which got put aside for the next one, and that for the next, and so on). Two years went by. That catalogue number got used for another album. I moved. The label vanished. Only 9 songs had been written by that time. Public Domain seemed to fall into the public unconsciousness. In 2007, with Adam's encouragement, I got serious about the Public Domain Project. The name, by the way, had grown from "Public Domain" to "Public Domain Project" because we found a DJ artist in England using the name Public Domain. Adam had suggested ours be called Public Domain U.K., which is totally awesome, but "Project" just seems classier. So that year I wrote more songs and recorded more demos. It was really for real going to happen, really. So, 2008. Totally. Wrote another new song and traveled to Vermont to record and re-record in Adam's studio. In one short week we got closer than in all those years. So of course I got distracted and halted the album's release again. "If you can read this, the album was released." So it's finally finished. Apart from the relief of finally finishing the record, I think it's really good. Adam rejuvenated my interest in 2007 by saying the Public Domain songs are my best work. And I'd have to agree. These songs are awesome. The album was recorded in various places over several years. While that would ordinarily produce a schizophrenic album, the very nature of the Public Domain concept actually lends itself to such variety. In a way I suppose the album would not have worked if it had been completed in a more typical timeframe. It's going to be really funny when I find someone stealing these songs and I'll have to sue. I'll be reasonable, though. I mean, I'm calling it "Public Domain Project." I'd be an idiot to not expect someone to believe the songs are free to use. Do you like the Public Domain Project? Toss a buck in the case. It's funny to pay for Public Domain music. Copyright © 1996-2019 Chris Combs. All rights reserved.